I've decided to try and participate along with Ali Edwards on her project, "A Week in the Life". There is a button to link on the left side if you want to find out more information or even participate too! Today is Day 1 for me: Monday. I may try and summarize the day here along with using the printouts Ali provided. I was afraid I would find it too challenging because everyday seems the same & boring to me but what pushed me to try this was: that's the point of this project. Capturing the everyday. I look at the albums that Ali has completed and I can't wait to look back and see what a "normal" week was for us. Start here: Ali Edward's blog for more information. My husband requested a diaper cake for a shower at work for one of his co-workers. I've done so many of these but realized that I'd never posted about them. I found the instructions several years ago here. After the first few I stopped using the exact numbers in the instructions and started eyeballing the amount of diapers needed to get the size I needed. Don't you love the monkey ribbon! Total score from Michael's! These cakes are great for showers because they can serve double duty as a centerpiece and as a gift. 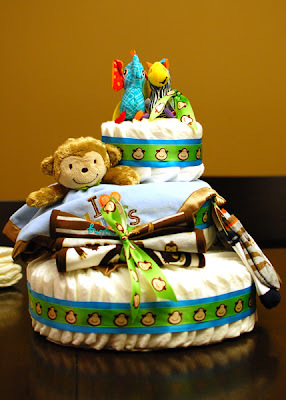 And the diapers are easily taken apart vs. unrolling them in the rolled diaper version. I find that the key to making it look good are finding toys that work well as toppers. I'll try and go through my pictures and put together a post of all the ones I've made. Just a quick post! Have a great day! 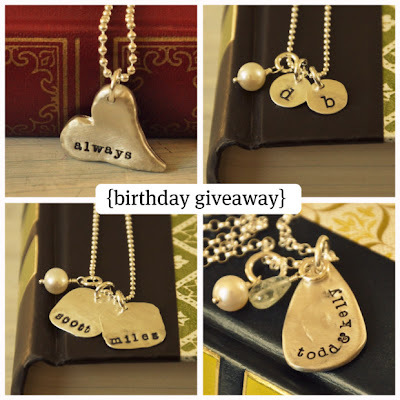 Today is PTI's Blog Hop! Check here for details and to post you own link. So this month's challenge was to post a technique or skill you have learned from a fellow stamper and to even send a shout out to that person(s). I've learned so much from other people in terms of stretching my comfort zone yet being comfortable with my personal style. I really couldn't pinpoint a particular skill to show but I did use this card as inspiration (3rd one down). 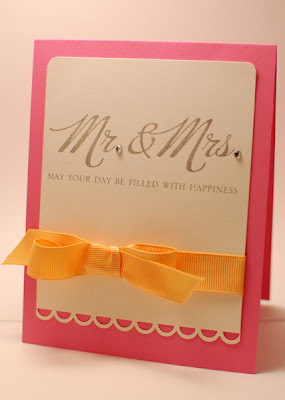 I loved the simple design and that it could basically be used for any occasion. Her bow-tying skills are definitely more advanced than mine! Thanks Dawn for the "sketch" and for always inspiring! She's pretty nice too... I've met her twice! The card is for a wedding I'm attending today. Sometimes I try to keep in line with the color scheme that's on the invitation. I know the thought and care that went into picking it so I try and show my appreciation by reflecting their color choice. This couple's invite was cream with pink accents and grey text. So I'm not totally in-line because of the orange ribbon... I said sometimes, ok? :) Anyways... I am loving the "Mr. & Mrs" sentiment from Big & Bold Wishes, it definitely is my go-to for wedding cards. I guess I could talk about one of my favorite things to do. I love adding a bit of shine to my images using the Sakura stardust gel pen... so easy too.. LOVE-EET!! Here's a close-up for you blingy-viewing pleasure! Have a great weekend! And have fun hoppin'! 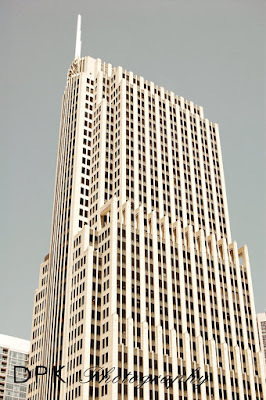 I had a random day off on a Wednesday a few months ago and the hubs and I decided to head downtown. I suggested going on the Architecture Boat Cruise because we'd never gone. Then we decided to invite our friends who recently got married. The bride is a transplant from Atlanta and so it was a great opportunity for her to see and do things in her new city! We started the morning off at the Bongo Room in the South Loop for breakfast. It was DECADENT. We ordered 3 dishes to share among the 4 of us and that was plenty! Architecture Boat Tour: After Breakfast we drove & parked near North Pier Docks. 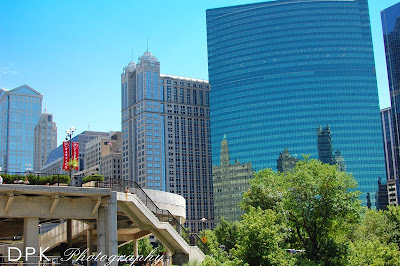 We went with Chicago Line Cruises because they had the longest tour (about 90 minutes) and the reviews on yelp seemed to be the best. Our docent was very knowledgeable and fairly entertaining. 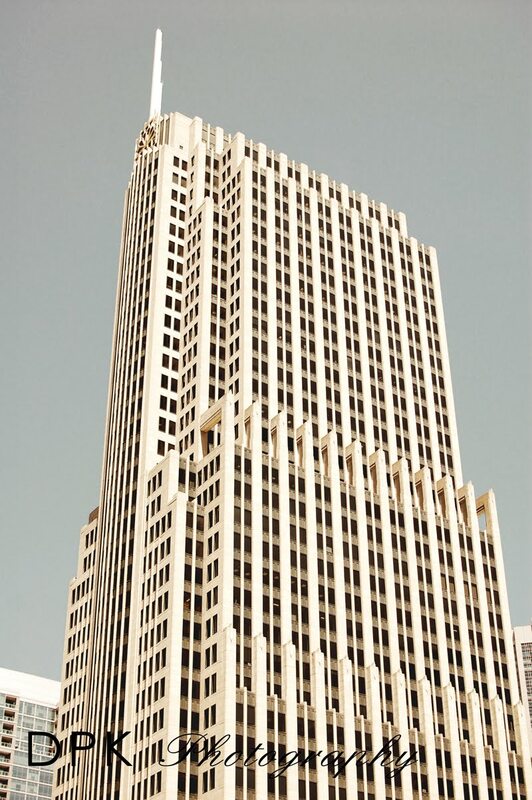 My dad was an architect and though we never had gone on a tour, I thought of him often during the cruise. Our friend, who's an engineer, really enjoyed it too but my hubs & his wife were not quite as excited. 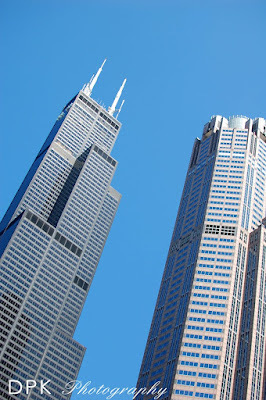 I also personally LOVE any history of Chicago so I was totally in my nerdy element :). It also helped that it was a GORGEOUS day! It's very photo intense from this point onward but I promise there is a "sweet treat" at the end! See the beautiful blue sky? This is an example of all the condos around the city that were remodeled from older buildings. Thought the pop of red was cool! This structure in particular brings the memories flooding back. My dad was the one who taught me that they were nicknamed the Corncobs. I photoshopped this picture with Maggie Holmes Urban Action. All in all, I thoroughly enjoyed the tour. I thought it was educational and I learned a thing or two about the basics of architectural styles in Chicago. I've heard of walking tours in the city, kind of doing the same thing... I think I'll have to do some convincing... maybe next summer :). Now our next stop was what my husband was excited about...Morton's Steakhouse. I'd never been and I love me some steak. We went for an early dinner so we were able to get the lunch special. 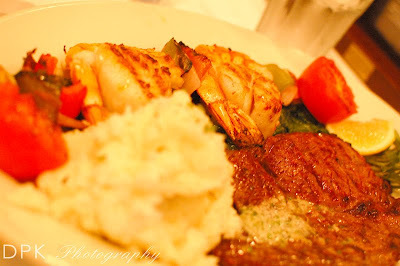 So for the price, I think the food definitely lived up to the hype... enough that I didn't get any good pictures! This is from my friend Yane. Delicious looking, isn't it. This was hub's surf 'n turf. So, now, here's your reward for reading down all the way to the bottom! They opened a Sprinkles Cupcake in Chicago! On the way out of the city we picked up 1/2 a dozen. Ginger Lemon, Strawberry, Red Velvet & Chocolate. So GOOD! Again, I think they lived up to the hype... hubby just doesn't get the whole cupcake craze... oh well. I know there isn't much photography talk in the post, other than photos. I will say that this was a rare time when I was shooting outdoors - using ISO 200. I'm usually at ISO 800, aperture wide open taking pictures of the little guy. So it was fun playing around with the settings. Let me know if you have any specific questions!! Since getting PTI's Tiny Treats: Valentine I have been dying to use the little dinosaur image. As you well know, I love "punny" sayings and this stamp set is CHOCK full of them. 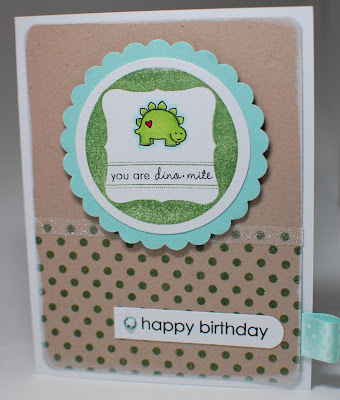 I really wanted to incorporate the dino image for T's first birthday but ended up going another direction. This set is not only good for making Valentine's cards but can be used for pretty much any occassion. 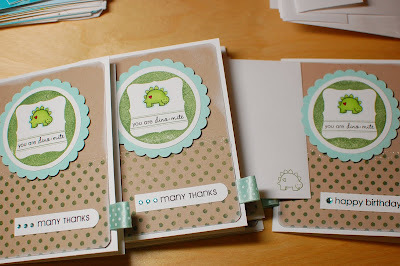 I started out by stamping the "label" image that comes with the set with PTI New Leaf ink. The dotted line is part of the image. 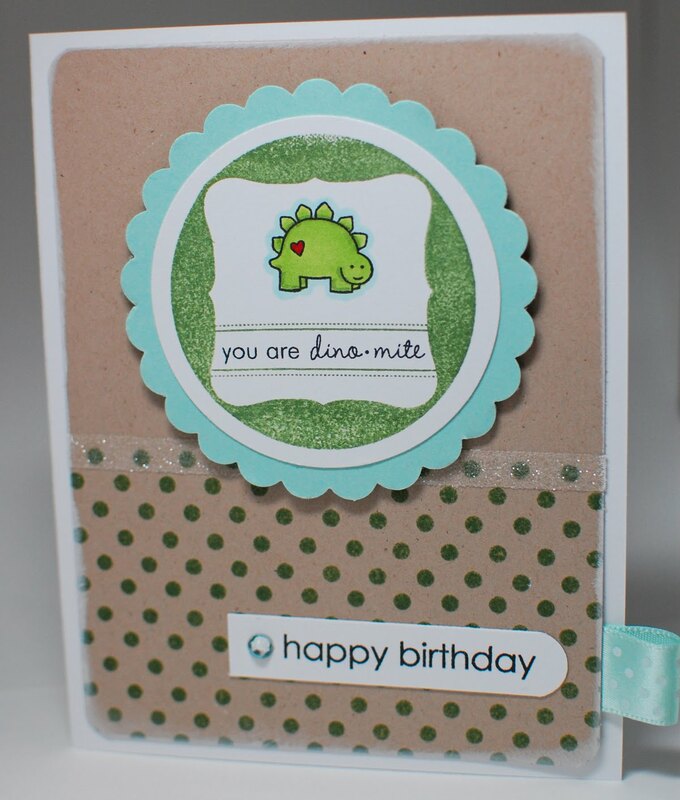 Then stamped the dino image and sentiment with black ink. Then I took Copics and colored the dino in. It's such a small image so coloring in 5 of them didn't take too long. I took care to shade a little bit with a darker green. I punched the image out with my pink Marvy Mega Circle punch. I matted the circle with a scallop circle shape in Aqua Mist (Marvy Mega Scallop punch). I went back I outlined the dino image with a very light blue copic color after I had matted the white circle. I think it pulled everything together with the blue & green. For the kraft paper matte layer I stamped Polka Dot Basics II background on the bottom half, again with New Leaf. Then used scor-tape & glitter to create a border of some sorts. The main image was adhered with foam dots for some dimension. 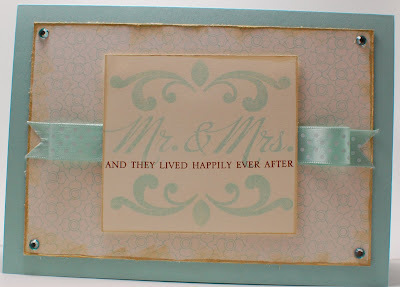 To finish things off, I added a little loop of swiss dots aqua mist ribbon next to the sentiment that was stamped then cut out. For some visual interest, I rounded the corners of one end of the sentiment using my Fiskars 1/4" corner rounder sqeeze punch. I did the same to all 4 corners of the kraft layer. 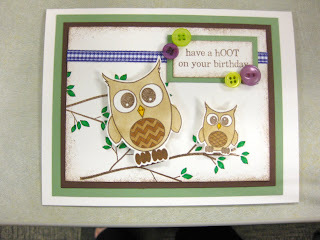 I used sentiments from my other sets, Shapes by Design & Fillable Frames #1. Either mini-rhinestones or regular rhinestones were added then "colorized" with a matching copic marker. I decided to make a few of the cards birthday cards and the rest thank you cards. I also love adding a little preview of the card on the envelope. So now they are all ready to go! Wow! It's September already! I'm kinda ready for the cooler fall weather- it's been a pretty warm summer even by Chicago standards! Well today's project is a card, actually 2 cards, that I made for 2 weddings. I've been trying to be productive and if I'm going to pull out supplies, I might as well make more than one card. And you guessed it! I used Aqua Mist CS. As inspiration I used this card. Using PTI's Big & Bold Wishes I stamped the focal image. 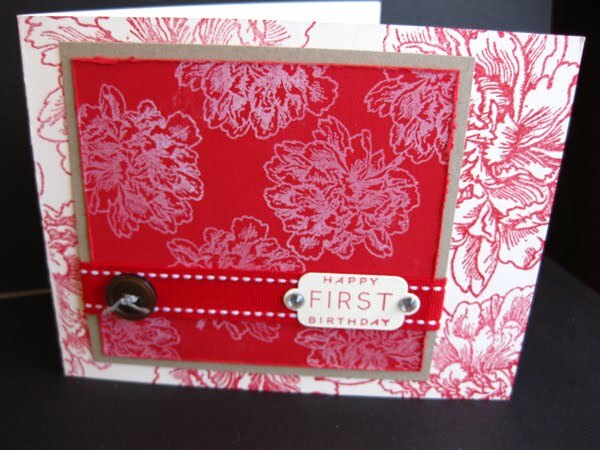 This stamp set makes it super easy to create a bold, yet elegant statement. Then with Background Basics: Petal Power, I stamped a background onto another piece of Vintage Cream CS. To add a little bit of dimension to the cream cardstock I swiped neatly around the focal image with the darker color of the Tea Dye Duo. On the background piece I distressed the edges and then swiped not so neatly with both colors of the duo. Since both the focal image and background piece are the same color, adding the distressed edging allows the focal image to standout but ties everything together. Lately, Nichole of Papertrey Ink has been using double loops of ribbon as embellishement and I wanted to give it a try. So I used the swiss dot ribbon to loop behind the focal image which I popped up on dimensionals. To give the whole thing some bling-bling I added clear rhinestones to the corners but if you look closely, I colored them with a matching Copic marker to make them look like aqua mist. 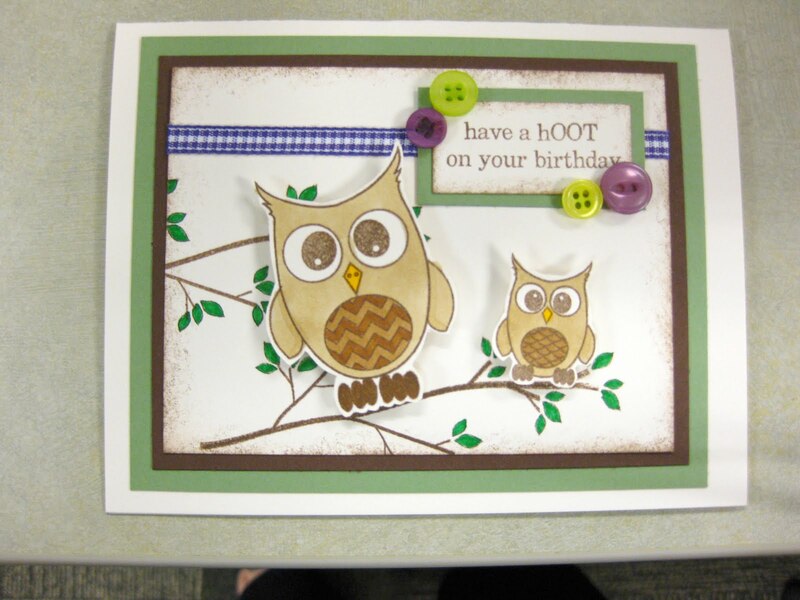 This is cool because you don't necessarily have to buy supplies in EVERY color... sometimes you can alter it to match! 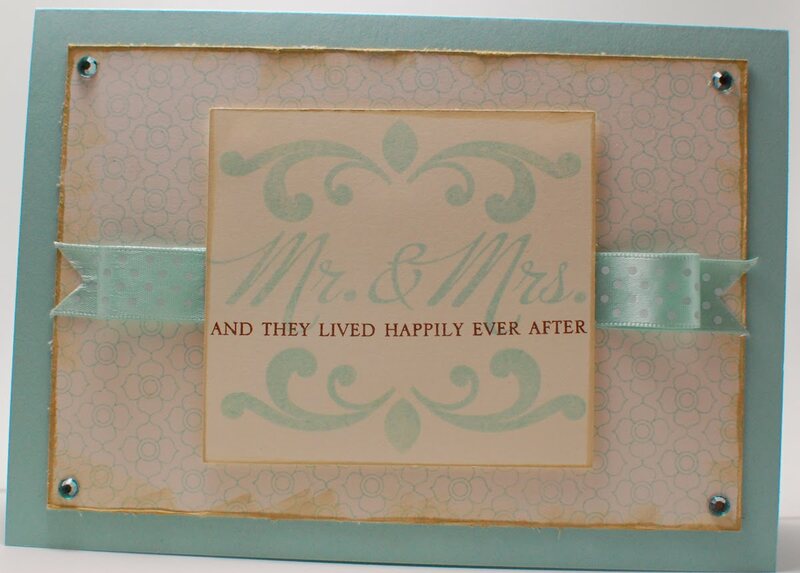 The overall effect was a pretty, vintage card, perfect for any wedding. I'm not a huge fan of this card because I made it in a rush but thought I would still post it. The picture isn't that great either 'cuz I took at work in nasty flourescent light. It uses PTI's Wise Owl set combined with Out on a Limb. Both owls are popped up on foam dimensionals. I colored them in with Copics. I was a true Copic newbie... you can see I tried shading but didn't really do a good job... not that I'm any better now :)... a little bit better. I do love the sentiments... ha ha ha... because they're punny... I love punny. The green mat, I think, is a SU! color. New Leaf wasn't out yet. The leaves on the branches are colored in with a marker, SU! as well. The buttons & ribbon are from my miscellaneous stash. Just thought you'd enjoy seeing a slightly different, non-baby, non-wedding card :)! So remember this wedding card? Well a year or 2 later... it's time for... then comes baby in the baby carriage! Gosh 2 years go so fast! If you notice a theme with me, I always have blue in stock. I love blue. And for this card it was Aqua mist baby! We were in a little bit of a time crunch so I made it postcard style. 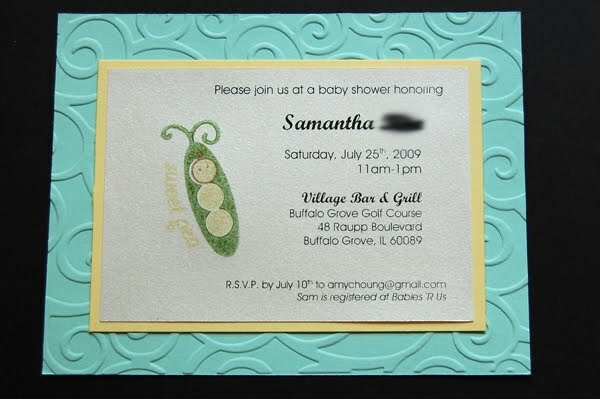 I printed the shower details onto ivory pearlescent paper (Paper Source). I stamped the little peapod from Green Thumbs in New Leaf and the inner peas with Spring Moss. Then I added the little baby face from Bitty Baby Blessings. The sentiment was curved a little bit to fit alongside the peapod. If you want to know the fonts I used... let me know, I forgot which ones exactly. I matted the ivory onto a piece of lemon tart CS. 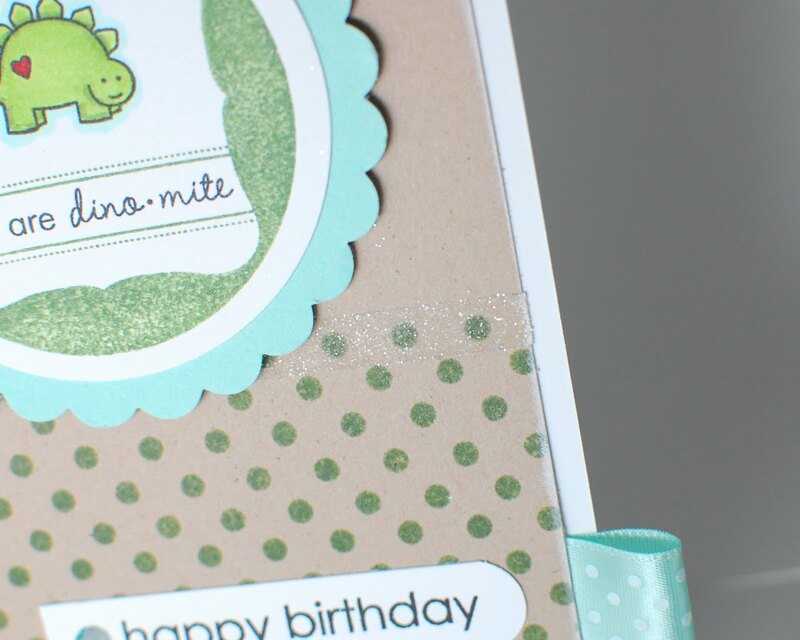 Then for the base, I ran aqua mist through my cuttlebug with an embossing folder and attached both layers onto it. 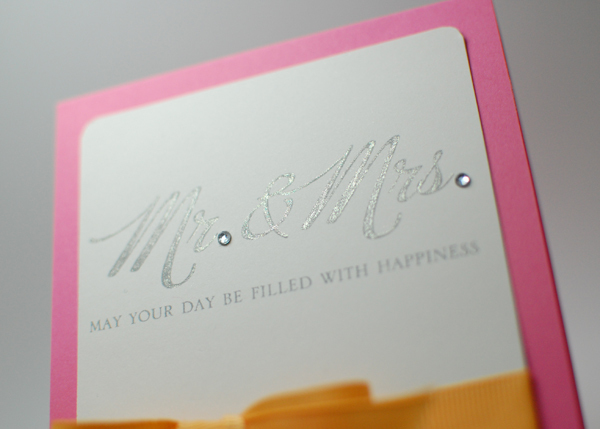 I felt that the embossing was enough to not warrant an more embellishments. One thing to note is that on shimmery paper like that, the Pallette/original PTI ink dries but just takes awhile. Also when stamping you have to be a little more careful to prevent smudging. Anyways... I first randomly stamped the smaller peony image onto Pure Poppy CS with SU! white craft inks. I also used my exacto knife to distress the edges of the red layer before I matted it onto a piece of kraft CS. I added some double-stiched Pure Poppy ribbon, embellishing it with a little sentiment tag (from Bitty Baby Blessings & my cuttlebug) and a random button. I matted both layers onto a vintage cream CS base that I had stamped with the larger peony image with Pure Poppy ink. Instead of centering the matted portion, I offset it to the left so that more of the larger peony image would show. Overall it was a little darker than I had intended but it matched the outfit I had gotten. I don't have a picture but I stamped a kraft colored gift bag using the same large peony stamp using pure poppy ink. That pulled the whole gift package together nicely! Now that I look at this, I think this would be great for an adult's birthday... maybe it's time to make some more with different colors??? Lisa Leonard is giving away a $100 gift card to her store AND $100 Target gift card on behalf of her birthday. I love her designs! I have the tiny square tags necklace and rarely EVER take it off. Her style is so simple & elegant. Stop by her store to see what she has to offer! 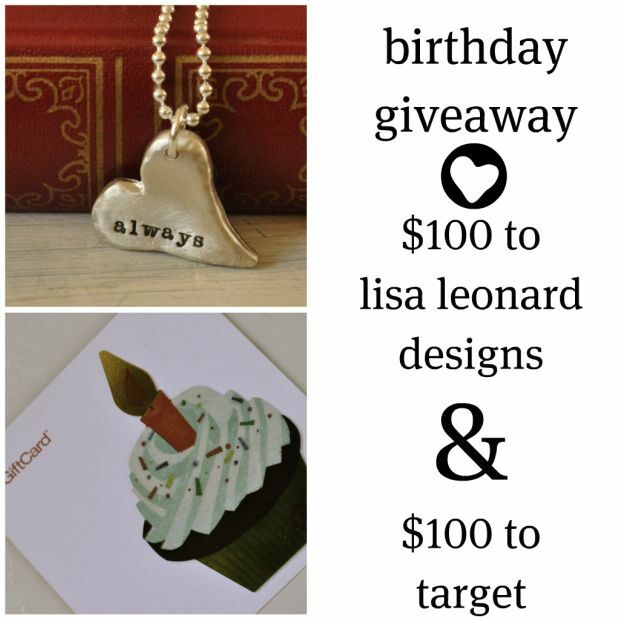 And go here for a chance to win!